It seems another year is upon us, and while I've never been a big one on resolutions, I do like to take some time to reflect back on the year. Growing is realizing your weaknesses and celebrating your strengths. Having the opportunity to see your favorite images from the year is so humbling and wonderful! I love that I get to see what my audience is loving most, and to see my growth in each image. Ever since picking up a camera, a ballet shoot has been the top of my list. I absolutely love the movement, strength, grace and beauty ballet displays. When Kelsey mentioned she did ballet and asked to do photos in her tutu she REALLY had to twist my arm. Totally kidding. This couldn't have been a better first try at a ballet shoot. I love mood, fog, simple colors and no fuss and while these may not be traditional dance photos, I'm really proud that they're not. These are truly #thatpnwballerina and I think that's amazing. And... do I even have to mention how gorgeous Kelsey is!??? Probably not, since you voted a second image from this shoot as number 2! Am I surprised to see this shoot on this list a second time? Absolutely not. Thank you Kelsey for being so gorgeous, and killing it! I just have to add that when you trust me and relax in front of the camera, magic happens. Easier said than done, but Kelsey's confidence and calmness really come across in this photo. This was all her, simply breathing and playing with her tutu. Sweet Gracie! The Rialto is one of my favorite spots in Tacoma to use as a backdrop. It adds a fun sparkle and minimal hint of color. I love it when I have clients that listen to outfit suggestions as well. While everyone has their own style, the atmosphere and my editing style really affect the flow of a photo. Gracie's simple black top and gorgeous gentle curls allow her to be the star of this shot without fighting the background. A little behind the scenes- I had Gracie looking at her friend Amy, which resulted in this adorable smile! If you're shy, bringing a friend along to your shoot can be fun and bring out more candid reactions as you'll focus on the camera less. I'm so excited to see this image on the list! This is one of my most recent shoots, with my most up to date editing and style of shooting. I love that you guys are loving it, and Kyra's stunning smile is definitely the crowd pleaser! Yay for these beautiful wintery tones, rich ruddy hair and nose wrinkle smiles! See the blog post here: Olympia Portrait Session- Coming Soon! Hey! Look who it is again! This has been one of my favorite shots because I'm all about embracing this Washington rain! It's not always realistic to do an entire shoot in the rain, but you can't get any more PNW than this! Thank you Gracie for laughing off the raindrops even when they were rolling down your face! This is another more recent shoot and so spontaneous! Leah is a former Britt Key Team Rep of mine and while she was home from college over Thanksgiving we headed out to Mount Rainier. Rainier has so many stunning scenic spots, but I love stopping at some of the less used places. This particular spot is always a challenge due to a shadowy tree line, but still produces a stunning backdrop. I had Leah doing a slight half swirl, which she looked at me like I had two heads when I asked it of her, but clearly it worked! 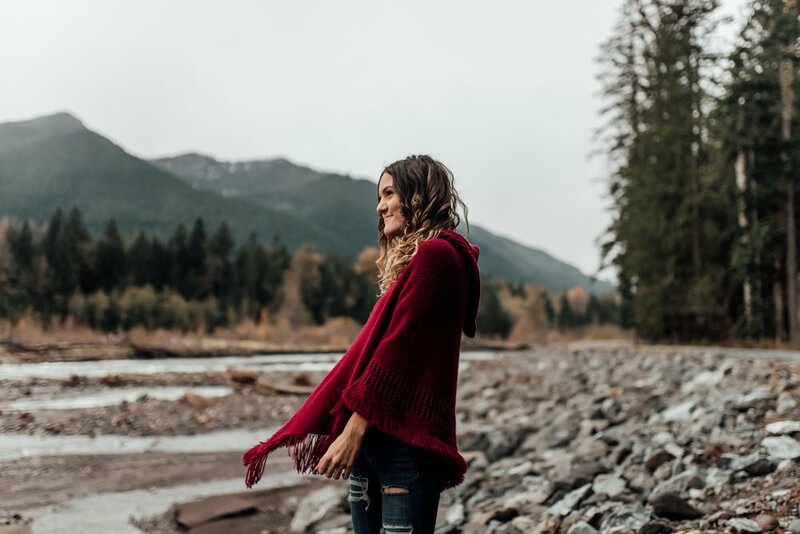 I love the movement in this shot and Leah's beautiful berry colored poncho contrasting with the deep blues and greens. We meet again! This beaut graces our list again, this time sans the tutu in place of... jeans! This is a top favorite image of mine because THE CONFIDENCE. Gah, I just love it when my subjects kill it! 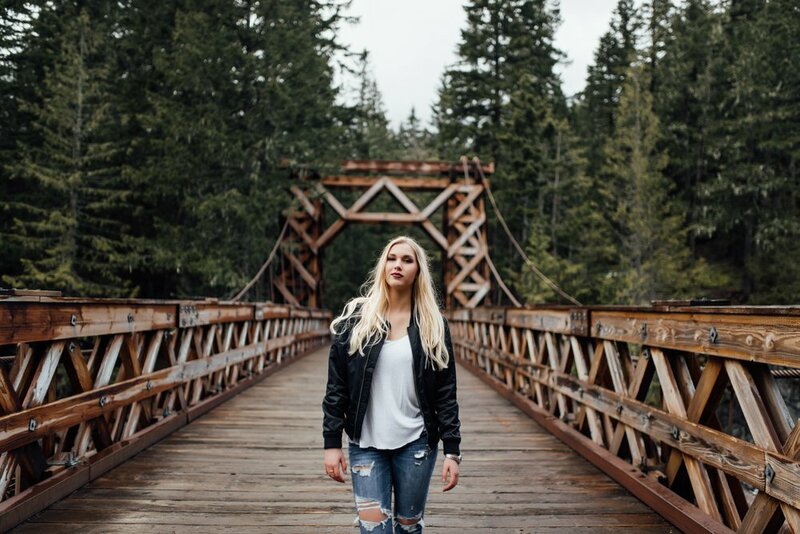 Kelsey's simple, yet trendy attire, bold lip and the stunning Mount Rainier bridge backdrop paired with a capital "C" Chin up Confidence just couldn't let you down. I'm seeing a ton of Mount Rainier photos on this list and I'm loooving it. I know where I'll be heading again soon! Mara was probably one of my first models ever when I started out, so I loved getting to work with her again. The fact that we actually made it through this shoot with all of our fingers and toes AND a top photo is a miracle. These photos were taken during a winter wind storm and OMG IT WAS SO COLD. Like, top most cold moments I've ever been in my life. The wind rattled overhead so intense, even yelling to hear one another was almost impossible and it shot off of the waves by the water like frigid knives. And yet, look at Mara. Nothing less than a fairy princess. We end with the gorgeous Lucy and her adorable husky puppy, Priya! This girl will leave you with serious hair envy, but when you combine her beauty and a cuddly puppy actually looking towards the camera, there's no wonder this was a favorite! Lucy's shoot was hot, and we stumbled around on so many river rocks, but came away with some beautiful images. Lucy was crowned the Governor John Rogers High School Daffodil Princess for Class of 2018 and I'm honored to have taken Her Majesty's photos! Thank you again to everyone for all of your support through 2017! I can't wait to see what growth 2018 has in store for me and hope to photograph your beautiful faces in all of the amazing places! Brittingham Photography specializes in natural High School Senior portraits, but also offers Britt Beauty Sessions (individual women's shoots), Lifestyle Newborn, Love Birds and Intimate Family Photos. Thank you for stopping by to read my little blog!